Roy Davis wrote "I am the minister who received Brother Branham into the first Pentecostal assembly he ever frequented. I baptized him, and was his pastor for some two years." Roy Davis was also a leader in the Ku Klux Klan (KKK), a far-right white supremacist organization. William Branham stated that, prior to ministering on his own, he was the assistant pastor at the Missionary Baptist Church in Jeffersonville, Indiana and that he served under the direction of Dr. Roy E. Davis, the pastor, who also ordained him. According to Douglas Weaver in his book, The Healer-Prophet, Roy E. Davis was the pastor of the First Baptist Pentecostal Church in Jeffersonville, Indiana. 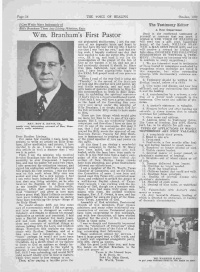 Roy Davis' church was not a Missionary Baptist Church as indicated by William Branham but was a "Holy Ghost church where they worship God in Spirit and not in fleshly denominations" (See Jeffersonville Evening News, 10 June 1933, 4:7). According to Roy Davis himself (see below), William Branham received the baptism of the Holy Spirit in Roy Davis' home in Jeffersonville. While Roy Davis had originally been a baptist, at the time that William Branham attended his church he was a Pentecostal minister. 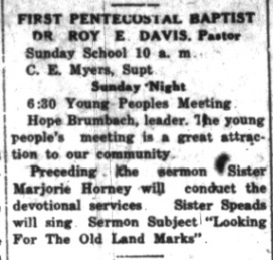 Dr. Roy E. Davis was the Pastor of the First Pentecostal Baptist Church, and Hope Brumbach was one of the speakers, according to this January 28, 1933 advertisement from the Jeffersonville Evening News. However, William Branham says that he first encountered Pentecostal people at a convention in Mishawaka, Indiana. While he was drawn to them and was invited to speak in their churches, he stated that he refused to join with them because of his mother-in-law. He indicated that this was one of the biggest mistakes of his life and God allowed his wife and daughter to be taken from him because of his disobedience to God in not joining the Pentecostals. This is a heartbreaking story that is familiar to all followers of William Branham; however, on closer examination, is it the truth? According to Roy Davis and Douglas Weaver, William Branham attended a Pentecostal church pastored by Roy Davis well before Hope died. Roy Davis himself says that William Branham received the baptism of the Holy Spirit in his home. This all precedes the death of Hope and Sharon Rose Branham in July 1937. William Branham tells how Hope, just before she dies, makes him promise to go back to the Pentecostal people. But how could he go back to the Pentecostal people if he had never left them? If he had been the assistant pastor in a pentecostal church and his own church was known as being Pentecostal before Hope died? The evidence follows. Can you tell truth from fabrication? First, I am the minister who received Brother Branham into the first Pentecostal assembly he ever frequented. I baptized him, and was his pastor for some two years. I also preached his ordination sermon, and signed his ordination certificate, and heard him preach his first sermon. I was the first man on this earth whom Billy ever saw anoint and pray for a sick person. I feel I can write more intimately of Billy Bran­ham than any living minister, as he also received his Baptism of the Holy Ghost in my humble home in Jeffersonville, Indiana. After that experience we were most "chummy" and grew to love each other a great deal. Many intimate conversa­tions were indulged in between us during those days concerning the deeper things of the Holy Ghost. He would always drift out into some sort of conversation which I did not grasp, and later came to disregard as entirely visionary, and finally to dismiss his strange cogitations as useless and irrational. I had been a Baptist preacher for many years, and had been taught to disregard such ideas and concepts of spiritual things as visions, talking with the Lord, and kindred things. Therefore this explains my impa­tience with Brother Branham, and at a time when had I listened also to that "voice" perhaps he would not have been circumscribed so long by my imposed pro­vincialism. As a direct result of my failure to listen to God on matters so deeply im­portant to us both and to the world in general, I went through the very fires of hell. Still I was unbending, and would NOT yield myself wholly over to God in matters which were more or less strange to me. Then, after paying a terrible price for my protracted stubborness, I got the con­sent of my dogmatic brain and heart let God have His way with my life. I had to see that I was "not my own!' and that see­ing such, I happily realized one day that God wanted to take my entire life, work over, fill it up, and send it out for the promulgation of the gospel of the Son of God as He wanted it to be, and not as had previously decreed it should be. Since that time, hallelujah, now several years past, I have been superlatively happy the REAL full gospel work of our precious Jesus. When I read of the way God is using my "Timothy" in the spread of the doctrines of God and His eternal love and power, my soul thrills exultantly, and my eyes fill with tears of genuine gratitude to Him for His condescension to work in Billy Bran­ham, in unfolding the spiritual mysteries of God's plan to a desert-conditioned world. I feel that I, too, will have a great interest in the Land of the Unsetting Sun over every soul saved under the ministry of Billy Branham. I so deeply thank God for the full surrender Billy seems to have made to Him. There are few things which would give me more joy than to be in one of his cam­paigns. But I, too, am conducting healing campaigns, and therefore I have no time to visit in one of his campaigns. But may I say, that I feel that every prayer that is prayed for Billy meets the approval of our Heavenly Father. Praying for Billy Bran­ham is tantamount to praying for anyone of the great apostles of love and power on this earth. I'm a Pentecostal Baptist. I got the Holy Ghost since I've been a Baptist. That's right. Well, I'm a Pentecostal Baptist now, you know. So I got the Holy Ghost. And so I remember when I first got converted though, and they give me my license in the Baptist church as local exhorter license and to do a little evangelistic work. I'd put my Bible under my arm and I'd go down the street, my, when they call me reverend, oh, I was a full fledged preacher. I received the baptism of the Holy Ghost back in my shed. See? And about a year later, or something like that, I was--I was--spoke in tongues. I tell you how I received it. I come just the way the Bible said it. I never varied for any denomination. My own Baptist church put me out because I wouldn't ordain a woman preacher. It's not Scriptural, and it's not right. And I said, "You might as well put me out, 'cause you have to sooner or later. So I'll just walk out before you do do it." All right. I was converted in a converted barroom. And I feel very much at home now. I look back there and see that counter, and so forth. It was a little, colored church, where I received the baptism of the Holy Ghost, was led there by the Lord. I know many of them think that I've lost my mind. Even my good old righteous mother, that died a few years ago. When I first received the Holy Ghost, there was no one in our country knowed anything about It. And I was just a local, little, young Baptist preacher about twenty years old. And did you notice in the "Voice of Healing," Brother Gordon's little paper that he puts out. In there, that same man come back, Doctor Roy Davis, and testified that he was ashamed of himself for the things that he had said, and he himself prays for the sick now. And Doctor Roy Davis was, Missionary Baptist Church that ordained me into the Missionary Baptist Church, was the one who sent him to me--the one who first told me I had a nightmare, when the Angel of the Lord came to me. Now he's preaching Divine healing himself. See? So he said in his letter, many of you read in the "Voice of Healing," where he said, "If I hadn't been backslid in my own heart, I would've believed the boy in the beginning." See? And so now he sent him over there. Be sincere. Be humble before Him. That's right. And Dr. Davis standing there, an old Methodist bishop was setting there with this young preacher. A young, Roy Davis he was setting there with this bishop. That infidel said, "Any of you guys," and some of them, the ministers was saying, 'Mark 16 from the 9th verse on is not inspired. It isn't inspired, so you can't depend on it.'" He said, "Well then, I'll say over there, 'Come unto me all ye that labor and heavy laden,' Matthew 11:27 said," I'll say, 'That's not inspired then.'" So he had him on a spot. And Roy said... The Holy Ghost begin to move on him, say, "Stand up there." So he said, the old bishop, he said, "If that infidel makes that challenge one more time, if I die in my shoes, I'll go to heaven believing God's Word." So he said, "Now, listen, son. Set down and let him just... He's just popping his own brain. Let him alone." So it was the Holy Spirit moving. So when he made that challenge again, he let out a big "Ha-ha" and held his watch up. "If there's a God, I'll die in a minute." Waited for a minute and said, "Didn't I tell you wasn't no such a thing? Ha, ha, ha," like that, laughed out like that. So Roy when he made that challenge said, "Why not some of you guys out there believe that God's so real," said, "try this sulfuric acid test." Now, now, I'm not telling people to do that. Don't you do it unless the Holy Ghost is with you. See? Now, I don't believe in taking up serpents, or... I believe if I was baptizing out in the water, and a serpent grabbed me, I'd throw him out on the bank and go ahead and baptize like Paul did or something like that. Or somebody slip poison to me, I'd trust God for my healing. That's right. But I don't believe in bringing things, say, "Come here and I'll show you I can do it." I think that's wrong. That's right. But Brother Davis walked up to the platform. We got a notary public's statement on this. He walked up there. He said, "Christian people," about two or three thousand setting there, he said, "I'm twenty-five years old." He said, "I'm a minister of the Gospel," and he said, "I--I know that my God is able to deliver me from that," but said, "nevertheless, if He does or does not, I'll never let that infidel stand there with that in his hand and challenge God's Word." He said, "I'll meet you in glory." Grabbed it out of his hand...?... and drank ever drop of it right down, stood there and preached the Gospel, and about fifteen hundred people received the baptism of the Holy Ghost setting in the meeting. Hallelujah. Yes, sir. I'm a Baptist preacher, out of a Missionary Baptist church, ordained by Dr. Roy E. Davis out of Dallas, Texas, and was made a local elder for the church at Jeffersonville. My first revival, five hundred came to Jesus Christ out of a three thousand congregation when I was twenty--about twenty-two years old. "Well," he said, "I been--I was a Vice President of the Southern Baptist Convention," and said, "you know who sent me here?" I said, "I have no idea." Said, "The same man that ordained you in the Baptist church, Doctor Roy Davis. And he said come over here." And he just got off, and they pushed him in on the grounds. I said, "Sir, I can only say what I see; I don't know." And the minister from the Baptist church, Dr. Roy Davis, who ordained me, told me I eat something and I'd had a nightmare. And he kinda made light of it. But he's preaching Divine healing today. But however, he said, "Billy, you've nervous." Said, "Go over home. I think you need a rest." I said, "Dr. Davis, I don't appreciate that. If that's the way it is, then you can just wipe my name off, 'cause I'm going to listen to God." When I was first converted and was ordained in the Baptist church, I had a good old teacher by the name of Dr. Roy Davis. I was ordained in the Missionary Baptist Church by Dr. Roy E. Davis from Big Springs, Texas. And then I was--been a Baptist. You know the Baptist church, you don't be put out of a Baptist church for your doctrine, because they have no doctrine; it's a fellowship. It's a fellowship, the Baptist. And each church is sovereign in itself. What you're put out of a Baptist church for is immoral living. So I left the Baptist church in order to be free from all denominations, that I could preach to the body of Christ. So, one day, I was out here praying, long ago. I'll tell you why, who I was praying for, was Roy Davis. And I was out here praying, because he had called me "a puppet," and I was praying for God to forgive him for it. And he had a press back there, wrote a paper. And that press caught afire and burnt down, a couple nights after that, while they were running it. And when the--Brother Davis, Doctor Roy Davis, many of you know him, who ordained me into the church, into the Baptist Church, when he said I had a nightmare, how would I, with a seventh grade education go and preach to kings and potentates and monarchs around the world. I can't tell you. When Dr. Roy Davis, that ordained me in the Missionary Baptist Church. And when the angel of the Lord come to me and told me I was to take this message around the world, he said, "Billy, you need some rest. You'd better go home." I said, "Dr. Davis, that Angel stood there and told me that." But when I walked to the platform, and it happened to be that he knew the old Baptist preacher that ordained me in the Baptist church, Doctor Roy E. Davis. Doctor Davis told him to come, see me when I come to the coast, to have me to pray for him. And he moved in and was setting in his wheelchair. And so they was... a minister, the one that ordained me in the Missionary Baptist church, Doctor Roy Davis. Sister Upshaw, the very one that sent Brother Upshaw over to me, or talked to him about me, Doctor Roy Davis. And so he was preaching, and had the First Baptist church, or the--the... I don't believe it was the First Baptist church, either, it was the Mission-... called the Missionary Baptist church at Jeffersonville. I'd heard of Pentecostal, but they were a bunch of "holy-rollers that laid on the floor and frothed at their mouth," and everything that they told me about. So I didn't want nothing to do with it. A Baptist preacher baptized me. I said, "I want to be baptized in the Name of the Lord Jesus Christ." Dr. Roy E. Davis baptized me in the Name of the Lord Jesus Christ when I was just a boy. And Doctor Roy E. Davis of the Missionary Baptist church that baptized me into the Baptist faith, was a--or Baptist fellowship we call it. And I remember when Brother Roy Davis, down there, and his church burnt down. That bunch of people was just like scattered sheep without a shepherd, had no place to go. And I... Mr. Hibstenberg was Chief of Police then, and he called me down there and he said to me, "I--We're here to help you." Said, "I'm Catholic myself," but said, "them people," said, "they don't... probably have their clothes." (It was during the time of the depression.) Said, "They go to other churches and they feel out of place, and they're good people. And I know many of them." He said, "Billy, if you want to start a church," he said, "I want you to know that we're behind you in anything we can do to help you." Now, I have been through these years, and this Tabernacle has stood, though I was ordained in a Missionary Baptist church by Doctor Roy E. Davis, about thirty-three years ago here in Jeffersonville... Now, I... Since then, I was in the organization just a short time, a few months, until something come up that was unscriptural by the church, and I told him I could not go that. Then, about seventeen years after that, I was, had become a minister, a Baptist preacher, of the Missionary Baptist Church. Dr. Roy E. Davis ordained me as one of the local pastors, give me rights then, by the state, to marry, bury, baptize, so forth. And the Missionary Baptist Church burned down, which I was assistant pastor, at the time. And Mr. Davis come back to Texas, which he was of Davis mountains, and--and down near Van Horn, Texas. That's where they come from. And so, while he was gone, I started to take over the congregation. When I first seen the Pentecostal people, and heard them speak with tongues, I'd been taught as a Baptist that that was of the devil. An old man, one of the first that I ever seen in the realms of Pentecost and came to my house when I was just a--a little lad, and set in my room. And I've been always, for Pentecost, I wasn't critical, but I didn't understand that speaking in tongues before these things happened. And I still, we know that there is some of it make-believe, but behind it there's a genuine article. And this man come to my room when I was just a boy preacher and set in there one day. And I come in and he went... he kind of jumped and threw his hands up and spoke in tongues . And he said, "Thus saith the Lord," speaking in tongues , said, "A great ministry lies before you that God will use you to shake the world." And the elderly brother, is setting right back there, is John Ryan. When we got to her mother--got to her mother...?... When we got over there, why there's where the trouble started, right there. She said, "William Branham, do you mean to tell me that you'd take my daughter out amongst a bunch of trash like that?" I said, "Well, look, Mrs. Brumbach. They're not trash." She said, "That's a bunch of holy-rollers." She said, "And you take her out of here, she'll starve to death." She said, "Today she might have something to eat, and tomorrow she might not have nothing to eat." And Hope started crying. And she said, "Mother..." She said, "I--I--I want to go with him." And she said, "Very well, Hope. If you go, your mother will go in a grave heartbroken. That's all." And then Hope started crying. And--and there, friends, is where my sorrows started. I listened to my mother-in-law in the stead of God. And I stood down there not long ago. Say, "Will it last?" Yes, sir. I stood there when my own baby, about fourteen years ago, fifteen, my own little baby, six months old when I was praying for it, and it died and it went out from under my arms. I was walking up the road... I lost my father, my brother, and my wife (You know my story. ), just because that I wouldn't hook myself up with you people. My mother-in-law said that we were too good to be with such people, said they were nothing but a bunch of backwash. Now, from here, listen. I listened to my mother-in-law instead of God, and forsaken the church, and went on back with the Baptist people. Right away, plagues hit my home. My wife took sick; my father died on my arm; my brother was killed. And everything happened just in a few days. A great flood hit the country and washed away the homes. My wife was in the hospital. And I was out on a rescue with my boat. And one night out in the water, my boat got in the current, and was going over a big falls. I couldn't get the motor started, and I raised up my hands, and I said, "Oh, God, don't let me drown. I am not worthy to live, but think of my wife and baby." And I tried again, and it wouldn't start, and I cried again to God. And then, just before going over the falls, the motor started, and I got to the land. William Branham's ability to captivate his congregation with a heart-warming… or heart wrenching… story, is well know. Among his favorite tales was the oft-repeated account of his introduction to the Pentecostal movement… a key event in William Branham’s life story. But the story didn’t end there... Not everyone in their family was as impressed with the Pentecostals as the young Baptist minister and his wife. But the lesser known tragedy is this… except for the very real loss of life, very little of this story is what it seems. Did William Branham really start out as a Missionary Baptist? In a letter that was published in the Voice of Healing magazine in October 1950, Roy Davis wrote the following: I am the minister who received Brother Branham into the first Pentecostal assembly he ever frequented. I baptized him and was his pastor for some two years… I was the first person whom Billy ever saw anoint and pray for a sick person. I feel I can write more intimately of Billy Branham than any living minister, as he also received his Baptism of the Holy Ghost in my humble home in Jeffersonville, Indiana. So, Roy Davis was his first pastor but not in a Missionary Baptist church. It was a Pentecostal church. And Roy Davis not only pastored the Pentecostal Baptist Church in Jeffersonville, but also referred to this church as a "Pentecostal assembly", and spoke of introducing William Branham to praying for the sick, and the baptism of the Holy Spirit. And these experiences all took place before 1933. The 1931 City Directory for Jeffersonville confirms that Roy Davis was the Pastor of the Pentecostal Baptist Church. This directory was printed two years before William Branham built his tabernacle, and before his marriage to Hope. Why did William Branham feel compelled to grossly misrepresent his "Baptist" roots? While we may never know for certain, one thing is clear… His introduction to Pentecostalism happened long before his story indicates. Was William Branham really a Baptist pastor? In March 1933, William Branham laid the cornerstone for his new church. But the name of the church was not “Branham Tabernacle” then. It was… the Pentecostal Tabernacle. In 2009, Believers International published a photo-anthology of William Branham’s life called “Messenger”. On page 11 of this book is a newspaper ad from the mid-30’s for William Branham’s church, the Pentecostal Tabernacle. Further, the obituary for Hope Branham clearly indicated that she was attending the Pentecostal Tabernacle at the time of her death. So William Branham was never the pastor of a Baptist church. But remember this part of the story? How could the death of William Branham’s brother, Charles, in a car accident on August 5, 1935… a full 2 years before Hope died… be related to his failure to embrace Pentecostalism when he was preaching in a Pentecostal church. Do you understand why we are having a hard time with some of this?? When was William Branham baptized with the Holy Spirit? As we mentioned earlier, Reverend Roy Davis’ testified that William Branham "received his Baptism of the Holy Ghost in my humble home in Jeffersonville, Indiana." This would have taken place prior to 1933 when he started his own church. So was it in Roy Davis' home… or out back in his shed… or somewhere else? So... how could God's prophet be so confused about when he received the baptism of the Holy Ghost, when he said it was impossible for such a thing to happen? Does God punish his children for disobedience by killing their loved ones? Compounding the tragedy of William Branham's personal loss and fabricated testimony is the fact that he suffered from a fatalistic, Old Testament view of God… a God who would wreak havoc, kill his wife and little girl, just to teach him a lesson… ironically for a rejecting something that he had been a part of for years! As a direct result of my failure to listen to God on matters so deeply important to us both and to the world in general, I went through the very fires of hell. Does the Bible really teach that we have to live mistake free or face the brutal punishment of a God of wrath? Doesn’t the Bible say that perfect love casts out all fear? If you are afraid, it is because you have not fully experienced the perfect love of God.? When we first heard these tragic stories from William Branham’s life, we naturally thought them to be true. Sadly, the facts show otherwise. Why did William Branham feel the need to misrepresent nearly every aspect of this story… his background, his faith, his conversion, the order of events. Did he really feel like God was punishing him? For a fictitious decision? Was it to gain sympathy, or to punish himself for the death of his wife and daughter? He certainly wouldn't be the first to suffer a mental break from such an event. Whatever the case, the tragedy is only aggravated when this manufactured tale is accepted as truth and then told and retold. Most people assume that when William Branham speaks of Jesus Christ, that he is talking about the same Jesus preached by the apostles. But that isn't consistent with his story of Gods "punishment". According to the gospel Paul preached, the wrath of God was unleashed upon his Son on Calvary. The wrathful punishment of believers as preached by William Branham, for mistakes that they make, bypasses the blood of Jesus and is not biblical. If this is your revelation… as obtained from the message… then it is a different Message from the grace of the New Testament that Paul preached. This page was last edited on 8 December 2015, at 05:57.